2-Way (1 inlet, 1 outlet) solenoid valves for oil and fuels, such as gasoline or diesel, usually have a brass body with FKM seals. Solenoid valves can be direct, semi-direct or indirect operated. 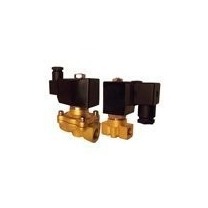 For small flow rates, direct operated valves are suitable (orifice ca. 3 mm). For larger flow rates, semi-direct or indirect operated valves are recommended. Indirect operated valves make use of the medium pressure to open. When the differential pressure across the valve is less than 1 bar, indirect operated valves cannot be used. 2-Way valves are normally closed (voltage = open) or normally open (voltage = closed). For contaminated or highly viscous fluids, solenoid valves are unsuitable. In this case, electric ball valves are better suited.